Following on from my previous blog on the subject of rhubarb, I have been asked just how difficult it is to grow this vegetable. To be honest, when it comes to what I’m growing in my garden I have never been one for following trends. Whether it’s yellow courgettes or carnivorous plants the latest horticultural marvel will usually be something exotic and wondrous that takes enormous effort to fit into an already packed garden and takes time away from everything else, often for little gain that couldn’t be achieved more easily with something else. That said, I have to say I am loving that rhubarb has become the TV darling of the veg world of late – even Countryfile got in on the act!. Finally, style has met practicality! I’ve always loved rhubarb, both as an ingredient and as a plant, and one of the main reasons is that it is just so easy to grow! Indeed if it were any easier to grow rhubarb in your garden we would be pulling it up as a weed. It’s a perfect starting point for any beginner gardener, especially if you’ve always fancied growing your own food. Still that simplicity can be a little misleading, it can make you think there is just one way to grow and enjoy it when actually there is more you can do. So here’s a few clever tips on making the most out of your crop. Many people think that there is simply one type of rhubarb called Rhubarb; the long pink stemmed plant thing with the green leaves on top that you can eat come summertime, but this is not the case. There are a multitude of cultivars that range widely in their growing habits and, most importantly, when they become edible. Choosing which one or ones you wish to grow can seem daunting but here are a few that can extend your crop and make things a bit more interesting. Timperley Early: Possibly the most common of home grown rhubarbs, this gardeners favourite will be ready for cropping around the beginning of April, a while before other cultivars. Reliable for producing a good yield of stems it is also well suited to forcing and produces plenty of succulent stems with that classic rhubarb sharpness. Victoria: Another commonly used cultivar, this time by the commercial sector. Victoria is known for providing a wealth of thick red stems with a rich and powerful flavour. It’s a slightly later cropper, ready for pulling in mid to late May and is particularly good in a jam or preserve. Livingstone: For long lasting satisfaction the addition of Livingstone to your crop is a must. This silky and almost stingless variety of rhubarb will be ready to crop in early summer, but it will keep producing even into autumn! As with all rhubarb varieties it will become dormant once the cold weather gets to it, but in a mild autumn you can be enjoying rhubarb right up to the turn of the season. Don’t let the cropping times fool you, rhubarb is a stalwart perennial that does not mind much when it is planted. Potted rhubarb can be planted at any time of year as long as the soil is alright, if it is waterlogged, frozen or dry as a bone then nothing will be happy being planted in it. If you decide to plant a crown or a budding cutting then the best time to plant is in late spring or early autumn when the soil is moist but still relatively warm just to ease the plant in. Rhubarb grows best in a well tilled soil, moist but with good drainage and a sunny position will keep it a happy plant. Rhubarb plants can grow quite large so be sure to leave some room, about 75cm between each plant. Remember the one limiting factor with rhubarb is that it does not like disruption, once you’ve picked a spot for your rhubarb to grow try not to move it. This makes preparation a good idea as wherever your rhubarb is going it will be staying there for a while. Make sure to dig the bed thoroughly and fork through some organic matter (compost, manure, mulch) before planting and your rhubarb will thank you for it. Once planted rhubarb is an extremely easy going plant and will often not ask for much to keep growing. 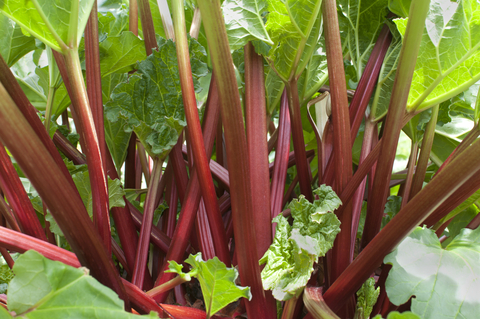 If you want to make the most of your rhubarb crop though there are a few things you can do. Flowers: your rhubarb will begin to flower in spring, which will draw energy away from growing stems. Simply remove any flowers you can find when it starts to flower and you will end up with much longer stems come cropping time. Watering: As I mentioned, rhubarb doesn’t need much but it does need moist soil. Usually the weather will be more than adequate to keep the soil wet enough, but during the summer it is important not to let the soil dry out. Keeping your plants well watered will ensure they keep growing strong. Cutting back: Once the growing season is done the leaves will begin to die back naturally. When this happens you won’t be getting any more from that plant until next year so it’s time to get it ready for winter. Simply cut away the old stalks and leave the buds exposed to the cold. This may seem a little odd but rhubarb needs a good cold snap over the winter months to regulate its growing pattern. Once the stalks are cut back, fork in some manure to keep moisture in the soil and keep the plant well fed for next year’s growing season. Dividing: One thing about rhubarb plants is that they can grow quite large. This is fine for the a few years as it just means more stalks and in turn more crumble, but after five or six years the size of the plant will become a strain on it. You will start to see less growth as the plant puts all its energy into maintaining what it has. To avoid this simply lift the plant with a spade and divide the crown into three or four pieces, then replant each piece as an individual plant. This will make sure the new plants put all their energy into becoming bigger. Cropping: The best part of the whole process, harvesting or “pulling” rhubarb couldn’t be simpler. As the term would imply you harvest the rhubarb by gripping the stems at their base and pulling while twisting the stem away from the crown. Be sure not to cut the rhubarb as this makes the plant try to regrow the snipped stalk rather than growing a new one. Also, as tempting as it may be, do not over crop your rhubarb. Remember that the stems of the plant to serve a function for keeping it healthy so only ever take half the stems off the plant at a time. Now, while it may be tempting to just start pulling as soon as you see the first crop appear it is very important to leave it alone for the first year. During its first year after planting your rhubarb will still be getting itself established so harvesting it will disrupt the whole process and result in an unhappy and unproductive plant. Be patient, let the first crop die back and the next year you will be able to enjoy a bumper crop in earnest. Also, just as a word of warning, the longer the stems stay on the plant the more acidic they become. Once the stems look ready to pull you have a limited amount of time to pull them, it’s not a short period so don’t panic but don’t leave stems on the plant for ages hoping to save them either as they will become inedible. Old stems should not be eaten as they will be so acidic that they become poisonous and taste terrible and remember to never ever eat the leaves as they are always chock full of oxalic acid which will at best give you a mighty stomach ache so watch out.